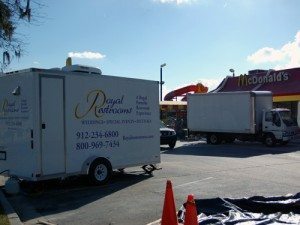 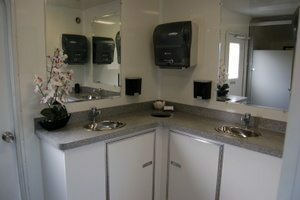 Royal Restrooms of North Carolina was an honored provider of upscale mobile restrooms and shower trailers for the 2012 Democratic National Convention and associated events held in Charlotte, North Carolina. 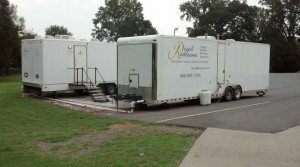 Thousands of convention attendants and guests, including city employees, volunteers, law enforcement, military personnel, the general public, media representatives, celebrities and politicians, were treated to the Regal Portable Restroom ExperienceTM prior to and throughout the week’s monumental event. 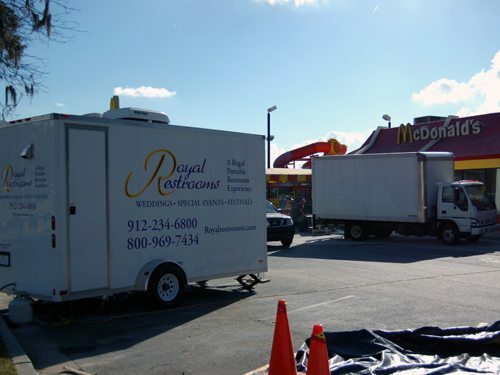 Well before the Convention’s commencement on Labor Day Weekend, Royal Restrooms took part in establishing mobile restrooms in the Media Village, a temporary yet massive arrangement of mobile trailers housing the media operations of the Convention just outside the Time Warner Cable Arena, and accommodated members of major news networks, such as CBS, CNN, FOX, NBC, and PBS. 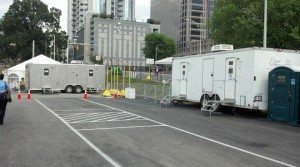 Additionally, restroom and shower trailers were provided at multiple temporary command posts established for convention security. Royal Restrooms of North Carolina was proud to extend luxury mobile restroom service throughout Convention Week for events such as The American Presidential Experience, a traveling, nonpartisan, interactive exhibit of the American presidency, and CarolinaFest 2012, Convention Week’s kick off event, featuring the Charlotte Labor Day Parade and live entertainment throughout the day.